Despite rising expenditure and general enrolment rates on a global level, educational output is stagnating, if not declining. There is increasing empirical evidence that we need a completely different approach to enhancing the learning curve; this holds true for early childhood, primary education, secondary education and higher education. Most existing educational programs do not tap into the full creative potential of our minds and our brains and often lead to suboptimal outcomes both for the individual and for society as a whole. Findings in clinical psychology, neurobiology and social psychology are not sufficiently considered when setting up appropriate educational programs. It is not the cognitive part of the curriculum that makes a difference, but rather the non-cognitive features (including stress management, impulse control, self-regulation, emotional attachment etc.) that improve creativity. A ‘six-pack’ of features, including exercise, nutrition, social contact, mindfulness-based practices, sleeping well, and multi-sensory learning, is introduced as part of a ‘creativity response’. They are simple, affordable, evidence-based and efficient strategies that can be implemented promptly without additional costs, increasing our learning curve. "Most exist­ing education­al programs do not tap into the full creative po­tential of our minds." Our current educational system developed in the 18th and 19th centuries. Yet we now live in a world where the half-time of knowledge is 5 years in most disciplines; we set up courses which last 3-5 years, and apply this learning to situations in which 3/4th of firms currently operating will not exist 10 years from now and 40% of jobs will be replaced by automation. The question is, how to improve the learning curve, unleash maximum creativity in each individual, and adapt this to the new world? What does science tell us about this question? We must bear in mind that education is always ambivalent: On the one hand, it has to conserve existing knowledge and transmit it to the next generation. On the other hand, it is supposed to prepare the present generation for the future while incorporating all the latest wisdom. "Education is an investment not a consumer good." Most existing educational programs do not tap into the full creative potential of our minds and brains and often lead to suboptimal outcomes. Findings in clinical psychology, neurobiology and social psychology are not sufficiently considered when setting up such programs. It is not the cognitive part of the curriculum that makes a difference, but rather the non-cognitive features (including stress management, impulse control, self-regulation, emotional attachment etc.) that improve creativity. The following text attempts to demonstrate that it is not the (cognitive) curriculum, not the input factors, but the non-cognitive factors in the educational process that are underemphasized, missed or misinterpreted. Thus, we constantly fail to improve the mental capacity for learning in our society. For several decades, the world has been spending an increasing amount of money on the educational system. This money is supposed to enhance the learning curve and the capac­ity for problem solving in a more complex world; it is supposed to make access to the labor market easier, thereby resulting in better living standards, and to improve the greatest capacities and talents in each individual as an end in itself. * This form of input supposedly correlates with an increasing output. However, the link between input and output is pretty weak in education. Some examples should serve to demonstrate this:† Developing countries have tripled the enrolment rate over the last 50 years and individuals there now spend more years in school than in OECD countries in the 1960s. Brazil and South Korea spend about the same amount of money per capita on education. But South Korea outperforms Brazil by 176 PISA points.‡ The US spends over 10.000 USD per year per capita on students aged 5 to 15, while Poland spends 3.900 USD on the same cohort, but both countries have similar outcomes. Finland spends the same as Spain, but Finland has 80 PISA points more than Spain. 4/5th of fourth-graders in India cannot read, despite increasing enrolment rates in the country over the last decade. In OECD countries, spending has increased by a factor of 2-3 over the last 50 years, but the results have been stagnating for decades. In the US, spending has been the highest in the world over the last 50 years, yet no change has been seen in reading or mathematical skills over the last 40 years; in fact, they have partly grown worse. Should we continue along this path of ‘more of the same’: more teachers, more chalk, tablets, toilets, computers, fixed roofs, textbooks, more input? If we take current educational progress in developing countries (PISA, TIMSS or other measures) and project it into the future, it would require 60-100 years (!) and more to gain, for example, 100 PISA points in learning assessments. In some developing countries it would take 100-330 years to catch up with the pace of learning in OECD countries. Maybe we are doing something wrong and failing to understand the process of learning, creativity and education in the 21st century. Pumping in more of the same does not make sense.§ We are spending more and more money and achieving less and less outcome. Input is not output, schooling is not education and learning is not creativity. Two biases and false convictions are relevant to gaining a better understanding of this skewed development: First, we spend twice as much money on higher education as on primary education and even less on pre-schooling, despite the fact that the educational Return On Investment (ROI) of any early educational intervention is up to 10 times higher than in higher education.¶ This is irrational, feeding only into the short-term demands of the labor market and not into the more general, long-term demands of the individual and society. Second, we do not differentiate sufficiently between the different intermediate factors that constitute the input and output factors. Roughly about 1/4th can be attributed to input such as schooling infrastructure, teacher-student ratios, pencils, textbooks, computers and so on. 3/4th go somewhere else. ** They basically go into the black box that lies between the input and the output of the educational system, described in the following section. The intermediate black box refers to what is happening between input and output, namely what is happening in the classroom. Basically, two major factors are involved: a cognitive and a non-cognitive factor. The cognitive factors refer to the curricula or the programs in place. For primary and secondary education, this concerns skills such as numeracy, reading, calculation, verbalizing, arguing, debating, literacy, and thinking. In higher education, these are the different degrees students are applying for, from law to bio-science, from medicine to economics, from the humanities to agriculture, from arts to engineering.†† These cognitive factors follow a specific rationale and program in each faculty or discipline and they differ from non-cognitive factors. They refer to skills which are not explicitly captured and expressed by the official curriculum in which the student or pupil is enrolled. Non-cognitive factors comprise skills such as self-control, conscientiousness, curiosity, novelty seeking, grit, optimism, resilience towards failure, perseverance, emotional attachment, impulse control, executive functions like planning ahead or anticipating, stress management, self-regulation, cognitive flexibility, increased working memory, focused attention, sitting in silence and so on. In the following pages I will emphasize that it is the non-cognitive skills that are key to good outcomes in education.‡‡ They can be enhanced in two major ways: first, by personal and interpersonal skills and second, by specific lifestyle changes, which include a ‘six-pack’, what I call a ‘creativity response’. We will look more closely into this later in the coming sections. 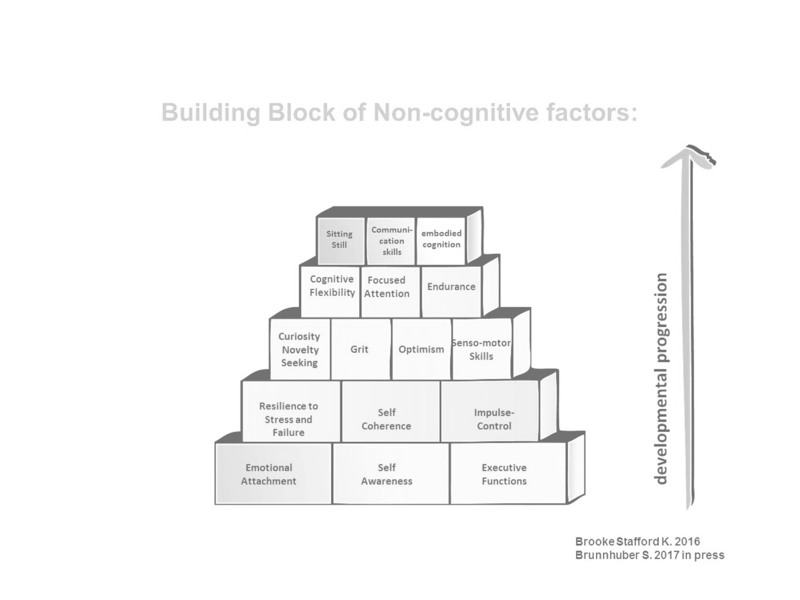 Figure 1 illustrates the non-cognitive building blocks necessary to enhance learning and creativity. Besides the (inter-)personal and psychological features, there is increasing empirical evidence of at least 6 medical and psychological domains that can make a significant difference regardless of the discipline, the curriculum chosen and the stage of education in question. I call this the ‘six-pack’ or the ‘Creativity Response’; it refers to several specific lifestyle modifications and attitudes, which can in part be implemented in the classroom. In the follow­ing sections I will simply provide some examples to outline the argument. Pre-clinical, clinical and population-based data show that exercise enhances cognitive performance, memory functions, attention span and so on. A simple 90-minute walk* in the park already significantly reduces worrying and repetitive thought processes, increasing cognitive speed. Simple long-distance running can increase the IQ.† Additionally, neurogenesis, reduced pro-inflammatory states and increased blood flow in the brain are associated with numerous exercise programs.Walking increases the blood flow in the brain by 13%, while jogging does so by 25%. Exercise is proven to be stress-releasing and has a positive impact on sleep and concentration. A simple 4-minute in-class intensive exercise interval program over several weeks already increases the attention span, mathematical skills and overall performance.‡ And this effect is in part dose-dependent: The more, the better (20 minutes versus 10 minutes).§ And the more complex the sensomotoric exercise is, the better the results.¶ So what kind of exercise has the highest impact? Aerobic, resistance, coordinative or mental-based exercise? There is preliminary evidence that in order to stimulate the hippocampus and the prefrontal cortex, which are both necessary to improve resilience, performance, creativity and learning, we need forms of sensomotoric exercise with a highly inbuilt mental and mindfulness-based component. So it is not only about running on a treadmill, weight-lifting and jogging, it is about more complex coordinative exercises or practices: yoga, qigong, martial arts. This is what Eastern wisdom is all about: increasing mindfulness in everything we are doing. Herbert Benson, together with John Kabat-Zinn, started identifying and standardizing mindfulness-based techniques, mainly from the East Asian tradition (Zen, yoga, qigong, Tonglen, tai chi, etc. )** Some of the findings are: mindfulness-based programs can stabilize and even reverse the degradation of grey matter in aging;* In long-term meditators, the impact on the hippocampus is dose dependent;† The more and longer a candidate has been meditating, the better his or her memory functions are. Mindfulness-based aspects are now implemented in a large number of syndrome-specific clinical programs. We have specific programs available for dementia, mild cognitive impairments,‡ depression, anxiety, suicidal ideations,§ pain relief, sleeping disorders and eating disorders among others. If we took these findings into the classroom–—this is called Mindfulness In School Projects (MISP)—what would happen? The non-cognitive factors, as described above, indirectly enhance cognitive performances.¶ Pupils learn to sit still, increase their attention span, learn to focus, become more resilient to stress and failure, improve their face-to-face communication and their capacity to distinguish between relevant and irrelevant information. Mindfulness is characterized as a form of improved or enhanced consciousness; it is not a technique for falling asleep. However, sleeping well is another non-pharmacological intervention which offers substantial benefits that increase the learning curve. By contrast, a study showed in 2900 Dutch subjects‡ that if social contacts are adverse or dysfunctional (crime, vandalism, noise, neglect), this not only increases biological age by 10 years, measured as perceived neighborhood stress and length of telomere, but a low level of social interaction was also found to have an impact equivalent to smoking nearly a pack of cigarettes a day or being an alcoholic. The way we learn is in part determined by the media we choose—whether a simple book or a complex computer program.¶ For example, one-channel learning through digital learning differs from the impact of multi-sensory and cross-modal learning:** an OECD study (2015)* showed, for example, that despite an annual global spending of over 20 billion USD on information technologies, students using computers very frequently show “no significant improvement” in reading, numeracy or science skills, and there is not a single country where performance is improved. When different senses are involved, from tactile (touch and balance), gustatory (taste), olfactory (smell), visual (sight), and auditory (hearing) to the sensomotoric system, any multi-coding learning generally leads to deeper memory consolidation and higher cognitive speed processing. 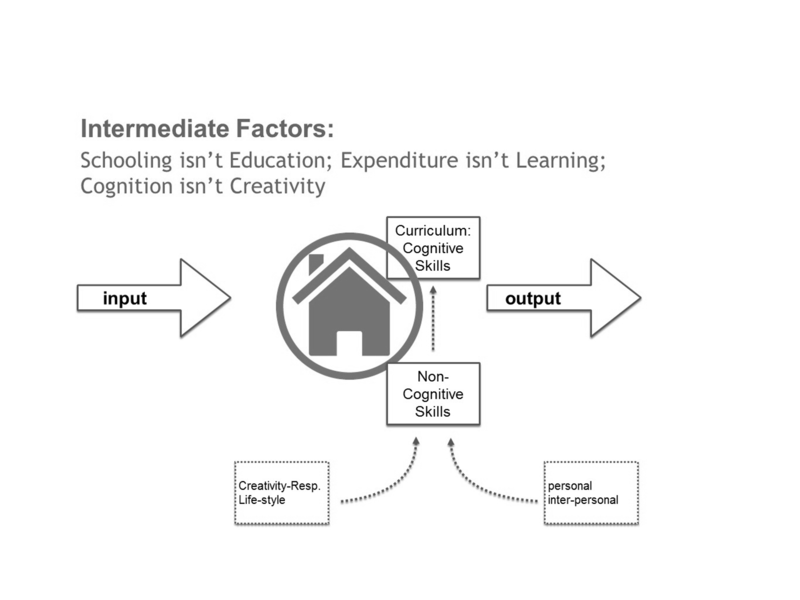 In conclusion, the abovementioned examples for each component of the ‘six-pack’ should simply support the idea that non-cognitive factors increase learning and creativity. They demonstrate the importance of non-cognitive factors in improving creativity and learn­ing: Mental and mindfulness-based exercises, multi-sensory and cross-model learning, meditation and silence, rest and sleep, reliable social contacts and a good meal all make a difference in education. Human beings cannot not learn. And if ‘Learning means changes of behaviors over time’ (D. Bandura) and if ‘Education is the most sophisticated technology evolved by human beings for conscious social evolution’, as Garry Jacobs defines it, besides psychologically skilled teaching staff we also need a lot of exercise, good-quality sleep, good meals, social contact, silence and meditation in the classroom and multi-sensory, cross-sensory learning to make that happen. The core argument presented here is that we have to differentiate between cognitive and non-cognitive factors and between psychological and lifestyle modifications. Overall, it is not the institutional input into the educational system, nor is it the cognitive input, represented by the curricula or the program the student is enrolled in, but rather the non-cognitive factors that can enhance creativity and learning in the individual and in society as a whole. * OECD, 2015, Sept, Students, Computers and Learning – Making the Connection. † This is one of the reasons why higher education constantly devalues the vocational, practical, haptic, social and emotional aspects of knowledge, referring to semantic and logical skills only, see: Julian Nida-Ruemelin, 2014, Der Akademisierungswahn: zur Krise beruflicher und akademischer Bildung, Körber. ‡ The Informed Brain in a Digital World: Interdisciplinary Team Summaries. Editors National Academies Keck Futures Initiative Informed Brain Steering Committee. Source Washington (DC): National Academies Press (US); 2013 May; Frontiers in Psychology 2015 Sep 8;6:1366. doi: 10.3389/fpsyg.2015.01366. eCollection 2015. “Efficient multitasking: parallel versus serial processing of multiple tasks”. Fischer R, Plessow F.
¶ “Fasting in mood disorders: neurobiology and effectiveness. A review of the literature”. Fond G, Macgregor A, Leboyer M, Michalsen A. Psychiatry Research 2013 Oct 30; 209(3):253-8. doi: 10.1016/j.psychres.2012.12.018. Epub 2013 Jan 15. ** Neurology 2015 Jun 2;84(22):2258-65. “Healthy eating and reduced risk of cognitive decline: A cohort from 40 countries”. Smyth A, Dehghan M, O’Donnell M, Anderson C, Teo K, Gao P, Sleight P, Dagenais G, Probstfield JL, Mente A, Yusuf S.
* Pritchett, Lant (The Rebirth of Education: Schooling Ain’t Learning, Brookings Institution Press, 2013) claims there are six components in a successful education system: open free access; decentralized and local organization; performance-based outcome measures; professional networking, including certified and monitored training; conference and communication among teachers; flexible financial and technical support. These institutional factors are necessary, but not sufficient, to improve learning in a society. † There is even a methodological bias built in: In most studies that are non-experimental with uncontrolled variables, input variables and unspecific uncontrolled variables are attributed to one another. This leads statistically to the false conclusion that the input is highly relevant for the output. However, as shown in this text, motivational, psychological, socioeconomic and non-cognitive variables (often classified as unspecified and uncontrolled) have a huge independent impact on outcome. See also Pritchett L, 2013 for the examples in this text. § The situation is more complicated than mere behavioral approaches employing incentives and reinforcements. In fact, Roland G. Fryer was able to show that in over 25,000 students there was no impact on performance, attention, compliance and long-term behavioral change, demonstrating that most such stimulus programs are ineffective to negative in educational outcome in older pupils and that there is no evidence of success in children. See Roland G. Fryer, Jr, June 2013, Information and Student Achievement: Evidence from a Cellular Phone Experiment, NBER Working paper 19113, Cambridge, MA, National Bureau of Economic Research June 2013; Fryer 2013, Teacher Incentives and Student Achievement Evidence from New York City Public Schools, Journal of Labor Economics 31, 2, April 2013. ¶ And even in the pre-school phase, as a community we spend the least money on early education and care, knowing full well that science tells us to do the exact opposite. For example, we spend only 5% on 0-2-year-olds and the other 95% of all money spent on pre-schooling goes to 3-5-year-olds. The Heckman curves demonstrate the huge losses we are creating by misaligning the money spent on education, see: heckmanequation.org or Noreen M. Yazejian and Donna M. Bryant, Educare Implementation Study Findings - August 2012 (Chapel Hill, NC: Frank Porter Graham Child Development Institute, 2012); or Noreen Yazejian, Donna Bryant, Karen Freel, Margaret Burchinal, and the Educare Learning Network Investigative Team, “High-Quality Early Education: Age of Entry and Time in Care Differences in Student Outcomes for English-Only and Dual Language Learners,” Early Childhood Research Quarterly 32 (2015). ** Pritchett, Lant, 2013, The Rebirth of Education: Schooling Ain’t Learning, Brookings Institution Press. †† Historically, over the centuries, general knowledge turned into discipline-specific expertise, going from fewer than 10 disciplines in the 19th century to over 50 in the 20th century to over 1000 at the beginning of the 21st century (including all sub-disciplines). This compartmentalization has expanded knowledge tremendously, but dissociates this knowledge from reality, producing masses of statistically significant, but in part irrelevant information (such as: ‘Do we really need this study?’) that is dissociated from knowledge in other disciplines (such as: ‘Do they really know what is going on?’) Any further cognitive specialization means that we risk losing our perspective of the whole. ‡‡ Angela L. Duckworth and David Scott Yeager, 2015, “Measuring Matters: Assessment Personal Qualities Other than Cognitive Ability for Educational Purposes”, Educational Researcher 44, 4 2015; see also Paul Tough, Helping Children Succeed. What Works and Why, June 2016, or How Children Succeed, Grit, Curiosity and the Hidden Power of Character, New York: Houghton Mifflin Harcourt, 2012; Terrie E. Moffitt et al., “A Gradient of Childhood Self-Control Predicts Health, Wealth, and Public Safety”, Proceedings of the National Academy of Sciences 108, no. 7 (February 2011): These studies demonstrate that the non-cognitive skills improve outcome parameters such as future income, health, societal success, credit problems, early pregnancy below the age of 15 among others. * The statistical measure for this is the Effect Size (ES), which indicates the difference of an intervention with regard to the standard intervention. So ES (d=1.0) means a difference of one standard deviation. Negative ES is of course something to be avoided, ES 0-0.2 reflects general development; 0.2-0.4, an average training program. Everything above 0.4 reflects an intentional attempt to improve learning outcomes, performance and ultimately creativity. † This is one of the reasons why the so-called constructivist (non-directive) approach failed empirically: students are considered to do their best if they are put into an enriching environment and then encouraged to find out what further course of action to take by themselves. This approach works well in pre-school, but the older the students/pupils become, the more they benefit from direct instructions, drill, feedback and self-evaluation. Constructivism is a theory of knowledge, but failed to become an educational intervention technique. * Gregory N. Bratman, J. Paul Hamilton, Kevin S. Hahn, Gretchen C. Daily, and James J. Gross, PNAS 2015 112 (28) 8567-8572; published ahead of print June 29, 2015. ‡ Applied Physiology, Nutrition, and Metabolism 2015 Mar; 40(3):238-44. doi: 10.1139/apnm-2014-0309. Epub 2014 Nov 10. Four minutes of in-class high-intensity interval activity improves selective attention in 9-11 year olds. Ma JK1, Le Mare L, Gurd BJ; Cell Metabolism 2016 Jun 21. pii: S1550-4131(16)30247-9. doi: 10.1016/j.cmet.2016.05.025. Running-Induced Systemic Cathepsin B Secretion Is Associated with Memory Function. Moon HY, Becke A, Berron D, Becker B, Sah N, Benoni G, Janke E, Lubejko ST, Greig NH, Mattison JA, Duzel E, van Praag H.
§ Research Quarterly for Exercise and Sport 2015 May 26:1-8. [Epub ahead of print] Acute Effects of Classroom Exercise Breaks on Executive Function and Math Performance: A Dose-Response Study. Howie EK1, Schatz J, Pate RR. ¶ Journal of Science and Medicine in Sport 2014 Sep 21. pii: S1440-2440(14)00177-7. doi: 10.1016/j.jsams.2014.09.007. The relationship between motor skills and cognitive skills in 4-16 year old typically developing children: A systematic review. van der Fels IM, Te Wierike SC, Hartman E, Elferink-Gemser MT, Smith J, Visscher C.
** See Herbert Benson, Relaxation Revolution, 2010. ISBN 978-1-4391-4865-5; Paulson S, Davidson R, Jha A, Kabat-Zinn J. “Becoming conscious: the science of mindfulness”. Annals of the New York Academy of Sciences 2013 Nov; 1303:87-104. * Frontiers in Psychology 2013 Jul 9;4:398. doi: 10.3389/fpsyg.2013.00398. eCollection 2013. Brain Gray Matter Changes Associated with Mindfulness Meditation in Older Adults: An Exploratory Pilot Study using Voxel-based Morphometry. Kurth F1, Luders E2, Wu B3, Black DS. † Meditation effects within the hippocampal complex revealed by voxel-based morphometry and cytoarchitectonic probabilistic mapping. Luders E1, Kurth F, Toga AW, Narr KL, Gaser C.
‡ Frontiers in Behavioral Neuroscience 2014 Jan 27;8:17. doi: 10.3389/fnbeh.2014.00017. eCollection 2014. “Effect of meditation on cognitive functions in context of aging and neurodegenerative diseases”. Marciniak R1, Sheardova K1, Cermáková P2, Hudeček D1, Sumec R1, Hort J3. § Med Care. 2014 Dec;52(12 Suppl 5):S19-24. Mindfulness-based stress reduction (MBSR) reduces anxiety, depression, and suicidal ideation in veterans. Serpa JG1, Taylor SL, Tillisch K.
** Bastien CH, Vallières A, Morin CM. “Precipitating factors of insomnia”. Behavioral Sleep Medicine 2004; 2:50–62. †† Irwin MR, Annual Review of Psychology 2015 Jan 3;66:143-72. doi: 10.1146/annurev-psych-010213-115205. Epub 2014 Jul 21. “Why sleep is important for health: a psychoneuroimmunology perspective”; or Tempesta D, De Gennaro L, Natale V, Ferrara M Sleep Medicine 2015 Jul;16(7):862-70. doi: 10.1016/j.sleep.2015.01.024. Epub 2015 Apr 14. Emotional memory processing is influenced by sleep quality.